The new Volvo Penta D1 and D2 series are designed with priority for highest comfort onboard. Low cruising rpm gives quiet running and low vibrations, and exhaust emissions are extremely low. Compact size means easy installation, and the 115 A alternator with a built-in charging sensor provides rapid charging for onboard electrical needs. Setting a new standard for yacht comfort. The base engine is developed for industrial applications for heavy and medium duty and marinized for the highest marine demands. This guarantees a reliable engine with a long service life. Delivery time: Approximately 21 days. Possibly faster in an emergency. New! See this video for an overview of connecting and sealing gasket replacement on a D2-55 saildrive. You would needs these parts to do the job: 21389074 (rubber bellows and seals) and 854932 (external seal). 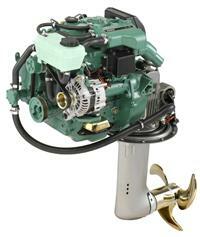 There are no remanufactured saildrives from Volvo Penta. We may be able to refurbish your drive if is it not too badly damaged or deteriorated. Your saildrive may be different from those listed here. Call us if you do not know your drive specifications. We also have a "drive finder" (drawings of what the different outdrive models look like) for your convenience. Click here.